Matthew N. Lyons has been writing about right-wing politics for over 25 years. His work focuses on the interplay between right-wing movements and systems of oppression, and responses to these movements by leftists, liberals, and the state. He writes regularly for the radical antifascist blog Three Way Fight, and his work has also appeared in the Guardian, New Politics, Socialism and Democracy, teleSUR, Upping the Anti, and other publications. 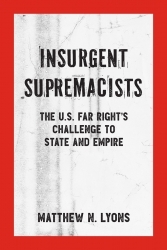 Lyons is author of Insurgent Supremacists: The U.S. Far Right’s Challenge to State and Empire (PM Press and Kersplebedeb Publishing, 2018). He contributed the title essay to the book Ctrl-Alt-Delete: An Antifascist Report on the Alternative Right (Kersplebedeb Publishing, 2017). He is coauthor with Chip Berlet of Right-Wing Populism in America (Guilford Press, 2000) and author of Arier, Patriarchen, Übermenschen: die extreme Rechte in den USA (Aryans, Patriarchs, Supermen: The Far Right in the USA [Unrast Verlag, 2015]). Lyons is co-trustee of the Lorraine Hansberry Literary Trust, which stewards the literary legacy of the late playwright and activist Lorraine Hansberry.